Cronic obstructive lung disease (COPD) describes a group of lung conditions (diseases) that make it difficult to empty the air out of the lungs. This difficulty can lead to shortness of breath (also called breathlessness) or the feeling of being tired. COPD is a word that can be used to describe a person with chronic bronchitis, emphysema or a combination of these. COPD is a different condition from asthma, but it can be difficult to distinguish between COPD and chronic asthma. Two people may have COPD, but one may have more symptoms of chronic bronchitis while another may have more symptoms of emphysema. It is helpful to understand the difference between the two conditions, as COPD means a person may have some chronic bronchitis as well as emphysema. How do I know I have COPD? Cough, sputum production or shortness of breath that will not go away are all common signs of COPD. These signs and a history of smoking will usually indicate the need for a test called spirometry, which measures if you have airway obstruction or not. How does my healthcare provider know I have COPD? Your healthcare provider will decide if you have COPD based on both your reports of symptoms and test results. The single most important test to determine if you have COPD is spirometry. The most important things you can do to help your healthcare provider in determining if you have COPD is to: 1) be honest about your smoking history; 2) share your exposures to pollutants and chemicals; and 3) remember, as best you can, when your symptoms first started. Asthma is a condition of chronic swelling of the airways. These airways are sensitive to stimulation by a number of things, such as infection, cold air, exercise, pollens, etc. The swelling may produce an obstruction of the airways, similar to COPD. Some people with COPD also have asthma. Bronchiectasis is a permanent enlargement of the bronchi and bronchioles. The enlarged airways produce abnormal amounts of mucus, which can block (obstruct) the breathing passages. Bronchiectasis may occur after severe pneumonia. While bronchiectasis may at first appear to be COPD, the evaluation and treatment are different. Bronchiolitis is characterized by swelling of the small airways (bronchioles), usually resulting from inflammation or infection. This condition is more commonly seen in children after severe lung problems and in adults after lung transplantation. The narrowing of the breathing passages can be confused with COPD. Chronic bronchitis is a constant swelling and irritability of the breathing tubes (bronchi or bronchioles) and results in increased mucus (phlegm) production. Chronic bronchitis is diagnosed when a person reports cough and mucus on most days for 3 months during 2 consecutive years when other lung conditions have been eliminated as a cause. This means that other conditions (and there are many) that may cause sputum production or cough are not the cause. Airway obstruction occurs in chronic bronchitis because the swelling and excessive mucus production cause the inside of the breathing tubes to be narrower than normal. The narrowing of the airways prevents the normal amount of air from reaching the lungs. 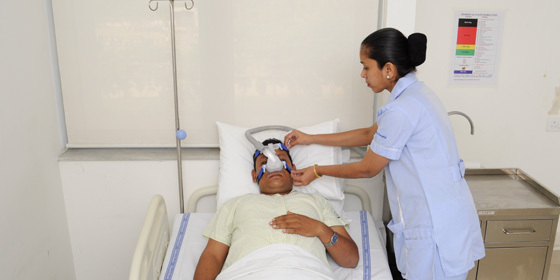 The amount of narrowing is measured with a breathing test called spirometry. Emphysema is a disease that involves the alveoli (air sacs) of the lung. Normally there are over 300 million alveoli in the lung. These alveoli are stretchy and springy, like little balloons. Like a balloon, it takes effort to blow-up a normal alveoli, however, it takes no energy to empty the air sac because the alveoli spring back to their original size. In emphysema, the walls of some of the alveoli have been ruined. When this happens the alveoli become stretchy and act more like paper bags. A paper bag is easy to blow-up, but you need to squeeze the bag to get the air out. So, instead of just needing effort to get air into the lungs, it also takes energy to squeeze the air out. As it is difficult to push all of the air out of the lungs, they do not empty efficiently and therefore contain more air than normal. This is called hyperinflation or air trapping. The combination of constantly having extra air in the lungs and the extra effort needed to breathe, results in the feeling of shortness of breath. The "obstruction" in emphysema is because the breathing tubes tend to collapse on exhalation, preventing you from getting the normal amount of air out of your lungs. This is a result of the loss of stable alveolar walls, which normally hold the breathing tubes open as your exhale. Airway obstruction is measured with spirometry (a breathing test). Several other tests can be performed that can tell your provider if it is likely that you have a lot of emphysema causing your COPD. The term chronic in chronic obstructive respiratory disease means all of the time, therefore, you will have COPD for life. While the symptoms sometimes are less after you stop smoking, they may never go away entirely. Improvements in symptoms depend on how much damage has occurred to your lungs. COPD symptoms usually worsen slowly over time. However, they can worsen suddenly. For instance, a cold, the flu, or a lung infection may cause your symptoms to quickly worsen. You may have a much harder time catching your breath. You also may have chest tightness, more coughing, changes in the color or amount of your sputum (spit), and a fever. Call your doctor right away if your symptoms worsen suddenly. He or she may prescribe antibiotics to treat the infection and other medicines, such as bronchodilators and inhaled steroids, to help you breathe. Chronic obstructive pulmonary disease (COPD) is the name for a collection of lung diseases, including chronic bronchitis, emphysemaand chronic obstructive airways disease. People with COPD have trouble breathing in and out, due to long-term damage to the lungs, usually because of smoking.What Are the Signs and Symptoms of COPD? COPD can cause breathlessness (also called shortness of breath or dyspnea), cough, production of mucus/sputum/phlegm and tiredness (also called fatigue). Symptoms such as breathlessness and fatigue cannot be seen or easily measured because they are sensations or feelings that you experience. Only the person experiencing the symptom can describe these sensations and how badly they make them feel. When symptoms first occur, most people ignore them as they think that they are related to smoking, i.e. "It’s just a smoker’s cough" or "I’m just winded/breathless from being out of shape". These symptoms can worsen to the point that people are motivated to stop smoking in order to control the symptoms. Others let the symptoms control them. These signs and symptoms of COPD (breathlessness, tiredness, cough and sputum production) are an indication that the lungs are not normal, even though the lungs are actually responding "normally" to the irritation. Many people with COPD develop most, if not all, of these signs and symptoms. Is coughing a symptom of COPD? Cough can be expected with COPD. Cough is a natural reaction of the airways to try and remove mucus or it can be a reaction to protect the airways from inhaled irritants. Coughing is therefore a good thing when it results in moving sputum or phlegm out of the breathing passages. For this reason, you will sometimes find your healthcare provider unwilling or hesitant to give you anything to prevent you from coughing. Conversely, cough resulting in airway spasm is not useful over a long period of time, but can be controlled with cough "suppressants". While a person with COPD will often cough, coughing does not mean you have COPD. What can I do to treat cough? Cough due to irritants can sometimes be controlled with "over-the-counter" (not needing a prescription) remedies like throat lozenges and cough syrups. Cough due to smoking will probably not go away unless the person stops smoking. If treatment with over-the-counter medications does not control the cough, your provider may prescribe medication. Coughs that are due to thick, sticky mucus can be treated by drinking plenty of fluids. Fluids can help loosen and thin the mucus. If fluids do not work, a cough expectorant or mucolytic may loosen the secretions. Coughing that produces spasm may require an inhaled bronchodilator and/or inhaled steroid. Coughing that does not produce mucus or that becomes violent and difficult to control will usually subside with cough suppressants (also called antitussives) such as codeine. Many people forget that simply drinking more fluids is often the best treatment for a cough. When should I call my healthcare provider about my cough? Most coughing is not dangerous. People without COPD should consider seeing their provider if they have a cough that has lasted several weeks or a cough without a known reason (for example, the common cold). In addition, people with certain conditions, such as a collapsed lung or hernias, may be advised by their provider to control their coughing with medications. Incontinence (inability to control passing urine during cough) may be another problem caused by coughing. Urinary incontinence during cough may occur more frequently in men who have had their prostate removed. Controlling the cough will reduce incontinence. Emptying the bladder more frequently than usual (e.g. every 2 hours) may also reduce incontinence. Pelvic muscle exercises are available and have been found to be useful in those with chronic problems with incontinence . Unexplained cough or coughing that causes you to "pass out" should be reported to your healthcare provider. Cough that does not go away with inhaler treatment should also be reported. Is shortness of breath (breathlessness) a symptom of COPD? Yes, shortness of breath, also known by the term breathlessness or the medical term of dyspnea, is a common symptom of COPD. Breathlessness is a feeling occurring when the lung changes from working in the way it was normally designed to work, to working differently. If the lung senses that it takes more work or effort to move air in and out of the lungs, a feeling of breathlessness will be experienced. While this feeling can be very uncomfortable to the person with COPD, it does not mean that the person is further damaging their lungs by doing things that make them breathless. Unfortunately, people try to avoid this feeling by doing fewer activities or activities less often. This strategy of avoiding activities to avoid breathlessness may work initially, but eventually avoiding activities leads to getting out of shape or becoming deconditioned. Becoming deconditioned can result in even more shortness of breath with activity. One of the greatest challenges for people with COPD is learning to continue leading an active life in spite of the difficulties breathing. Pulmonary rehabilitation programs are useful in helping people learn strategies to reduce this feeling of breathlessness with activities. An important principle for people with COPD to learn is to never avoid an activity because it causes breathlessness. To do so means COPD has taken control of you and you have lost control over your breathing problem. The first most important treatment if you are a smoker is to stop smoking. As well as helping you quit smoking, your healthcare provider may prescribe medicines that widen the breathing tubes (bronchodilators), reduce swelling in the breathing tubes (anti-inflammatory drugs) or treat infection (antibiotics). Medications have been shown to help stabilize the breathing passages and decrease swelling. In order to provide control of your COPD, these medications must be taken every day, probably for the rest of your life. Currently, there is no treatment available to restore damaged bronchi from bronchitis or alveoli affected by a large amount of emphysema. Unfortunately, the damage that has been done to the alveoli is permanent. In some parts of the world, surgery (lung volume reduction) can be performed as a way of removing some (but not all) areas of the lungs with large amounts of emphysema. With COPD you can learn to use the lung power you have more efficiently. You should learn as much as you can about your condition. Attending groups or enrolling in a Pulmonary Rehabilitation Program can be helpful. Pulmonary rehabilitation may also be recommended so that you can learn to be in control of your breathing, instead of your breathing controlling you. COPD can be caused by many factors, although the most common cause is cigarette smoke. 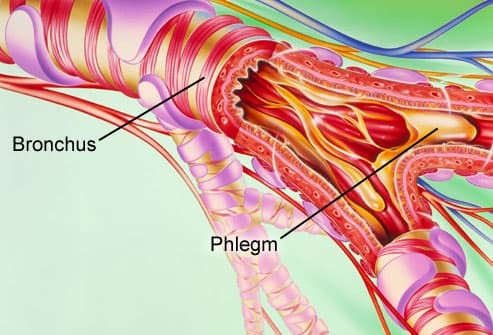 Inhaling irritating particles, such as smoke or air pollutants, can cause the mucus glands that line the bronchial tubes (bronchi) to produce more mucus than normal, and can cause the walls of the bronchi to thicken and swell (inflame). This increase in mucus causes you to cough, frequently resulting in raising mucus (or phlegm). COPD can develop if small amounts of these irritants are inhaled over a long period of time or if large amounts are inhaled over a short period of time. Environmental factors and genetics may also cause COPD. For example, heavy exposure to certain dusts at work, chemicals and indoor or outdoor air pollution can contribute to COPD. The reason why some smokers never develop COPD and why some never-smokers get COPD is not fully understood. Family genes or heredity probably play a major role in who develops COPD. Pulmonary rehabilitation (rehab)Pulmonary rehabilitation (rehab) can help you meet these goals. It helps train your mind, muscles, and heart to get the most out of damaged lungs. The program involves a team of health professionals who help prevent or manage the problems caused byCOPD. Rehab typically combinesexercise, breathing therapy, advice for eating well, and other education. Much of the treatment for COPDincludes things you can do for yourself. Oxygen treatmentOxygen treatment. This involves getting extra oxygen through a face mask or through a small tube that fits just inside your nose. It can be done in the hospital or at home. Help with depression. COPD can affect more than your lungs. It cancause stress, anxiety, and depression. These things take energy and can make your COPD symptoms worse. But they can be treated. If you feel very sad or anxious, call your doctor. If you have trouble quitting smoking on your own, consider joining a support group. Many hospitals, workplaces, and community groups offer classes to help people quit smoking. Ask your family members and friends to support you in your efforts to quit. Also, try to avoid secondhand smoke and places with dust, fumes, or other toxic substances that you may inhale. For more information about how to quit smoking, go to the Health Topics Smoking and Your Heart article and the National Heart, Lung, and Blood Institute's "Your Guide to a Healthy Heart." Although these resources focus on heart health, they include basic information about how to quit smoking. As a result, you may not get all of the calories and nutrients you need, which can worsen your symptoms and raise your risk for infections. Talk with your doctor about following an eating plan that will meet your nutritional needs. Your doctor may suggest eating smaller, more frequent meals; resting before eating; and taking vitamins or nutritional supplements. Also, talk with your doctor about what types of activity are safe for you. You may find it hard to be active with your symptoms. However, physical activity can strengthen the muscles that help you breathe and improve your overall wellness. This vaccine lowers your risk for pneumococcal pneumonia (NU-mo-KOK-al nu-MO-ne-ah) and its complications. People who have COPD are at higher risk for pneumonia than people who don't have COPD. Talk with your doctor about whether you should get this vaccine. Rehab may include an exercise program, disease management training, and nutritional and psychological counseling. The program's goal is to help you stay active and carry out your daily activities. Surgeries for people who have COPD that's mainly related to emphysema include bullectomy (bul-EK-toe-me) and lung volume reduction surgery (LVRS). A lung transplantmight be an option for people who have very severe COPD. When the walls of the air sacs are destroyed, larger air spaces called bullae (BUL-e) form. These air spaces can become so large that they interfere with breathing. In a bullectomy, doctors remove one or more very large bullae from the lungs. During a lung transplant, your damaged lung is removed and replaced with a healthy lung from a deceased donor. A lung transplant can improve your lung function and quality of life. However, lung transplants have many risks, such as infections. The surgery can cause death if the body rejects the transplanted lung. If you have very severe COPD, talk with your doctor about whether a lung transplant is an option. Ask your doctor about the benefits and risks of this type of surgery.